Research is the key ingredient to ensuring you get the most enjoyment out of your RV rental vacation. Deciding on when you are going to travel is the most important factor in determining how much your vacation will cost and how enjoyable it will be. Hiring an RV in the High Season doesn't just mean you will be paying more for your rental. Travelers can also expect higher rates for RV parks and sites, tourist attractions and even some restaurants. Availability, for both RV rentals and places to stay, also becomes limited and destinations become more crowded. While the Low Season is generally very appealing in terms of the low cost and high availability of RV rentals and parks, it also has its disadvantages. The weather may not be as desirable, the days are shorter and many of the tourist attractions don�t remain open. When it comes to choosing the best time to hire an RV, it pays to check out the prices on offer during the Shoulder Season. 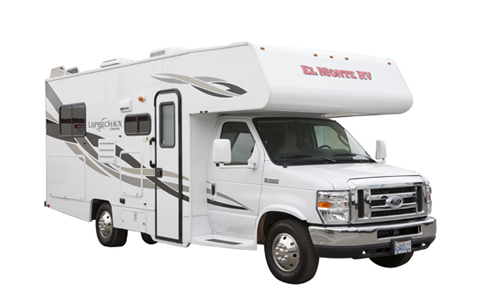 This period falls just before and just after the high season for RV rental (typically the end of spring and the beginning of fall) and offers a combination of desirable prices and weather. The concept is simple: if you avoid taking an RV vacation at the same time as the rest of the crowds, the price of your rental, and vacation as a whole, will be a lot cheaper. As the Shoulder Season falls just outside the High Season, the weather should still be good, ensuring you get the best of both worlds. So how do you pick the ideal time? Consult our Pricing Info Graphic of course. 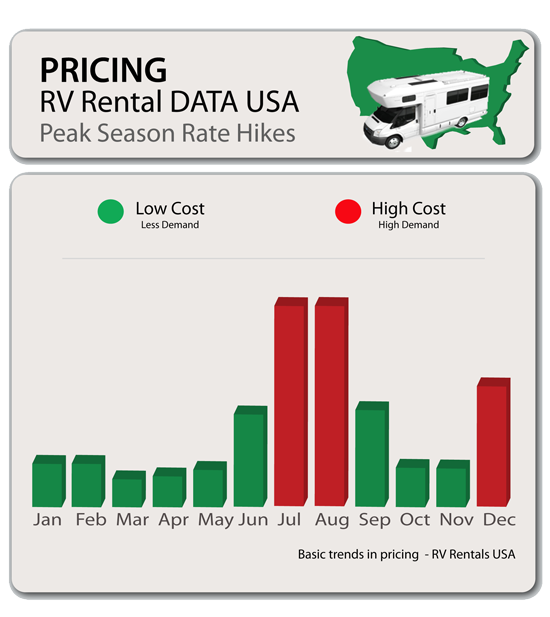 It visually depicts the cheapest times to hire an RV throughout the year. Based on when you wish to travel, you can then decide on your destination. North America is a huge region, filled with many extreme climates and varying landscapes. The United States generally experiences four temperate seasons in the north and two subtropical seasons in the south. However, in most US states the summer is hot, the winter is cool and spring and fall are generally mild. Experience eclectic art galleries and boutiques in the aroma of the gorgeous magnolias that are in full bloom. Experience this wonder of the world without the crowds of tourists. Don�t miss the flowers at the Flower Fields of Carlsbad California, the San Diego Museum of Art or the San Diego Zoo. Take advantage of shorter lines when visiting in spring. Pleasant temperatures will make exploration of Portland�s must-see museums and fun-filled festivals all that more enjoyable. The beaches are still suitable for swimming but you won�t have to put up with the crowds. The winters are harsh and summers humid in this National Park, making fall the best time to visit. October marks the beginning of the ski season in Colorado and is the best time to visit to avoid the crowds. New England is another amazing place to visit from mid-March through to April and mid-October to mid-November). Early spring brings with it budding flowers and romantic city streets, with only light daily rainfall. By mid-October, fall has well and truly arrived, bringing with it brilliant colors and landscapes. Always check for local holidays and festivals, as these can create high season pockets within the shoulder period. Most shoulder seasons fall between Easter and Thanksgiving so ensure you plan your timing well. Book as close as possible to the high season as the shoulder allows. This will give you a better chance of experiencing the good weather the high season offers. Remember to double-check that the attractions you wish to visit are open during the periods you are looking at travelling in.